In the arid areas of Sub-Saharan Africa, perennial challenges of water scarcity and food insecurity are exacerbated by climate change and variability. The development of robust strategies to cope with the region's climatic challenges requires thorough consideration of uncertainty and risk in decision making. 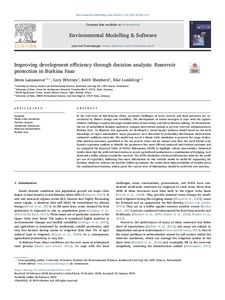 We demonstrate the use of probabilistic decision analysis to compare intervention options to prevent reservoir sedimentation in Burkina Faso. To illustrate this approach, we developed a causal impact pathway model based on the local knowledge of expert stakeholders. Input parameters were described by probability distributions derived from estimated confidence intervals. The model was run in a Monte Carlo simulation to generate the range of plausible decision outcomes, quantified as the net present value and the annual cash flow. We used Partial Least Squares regression analysis to identify the parameters that most affected projected intervention outcomes and we computed the Expected Value of Perfect Information (EVPI) to highlight critical uncertainties. Numerical results show that the preferred intervention to secure agricultural production is a combination of dredging, rock dams and a buffer scheme around the reservoir. The EVPI calculation reveals an information value for the profit per ton of vegetables, indicating that more information on this variable would be useful for supporting the decision. However, without the need for follow-up analysis, the results show high probability of benefits given the combined interventions, which, given the current state of information, should be preferred over inaction.